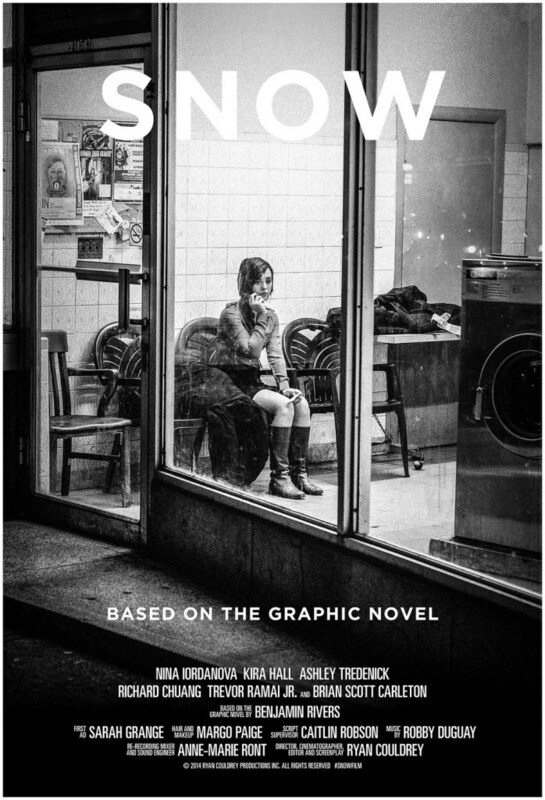 I first partnered with the director of Snow, Ryan Couldrey, early in the process of the shooting of the film. I’ve known Ben Rivers (who wrote the original graphic novel) for a couple years now, and I had a pretty good idea of how I thought Queen Street West should sound on the big screen. There really is a lot going on in the area, and a ton of influences to pull from. At the end of the day, I felt that stripping it down to the bare essentials would support the film, being in black and white and pretty minimalist in general. When you think of music in Queen West, it’s easy to picture street performers with electric or acoustic guitars, or small rock bands playing at the Horseshoe Tavern or something. One concept that I love to do as a composer is to represent characters and feelings not only with themes and motifs, but with actual instrument voices too. In Snow, Dana’s voice is played by a solo electric guitar. This gave me room to make her sound very alone, support her by an acoustic guitar (the voice of her best friend, Julia), layer her with a piano (the voice of Mr Abberline), or just do fun distortion and effects to represent the chaotic feelings she experiences. I recorded all of the electric guitar parts on an American Deluxe Fender Telecaster and Mesa Recto Studio Recording Preamp, patched through the Guitar Rig plugin to very gently add some room and mic effects and widen up the sound. I tracked the acoustic guitar parts at The Vine Studio in Mississauga, with the help of my recordist friend Lukas Loskot (until 4 in the morning one day). We also tracked live drums there with the help of my cousin Cam Duncalfe. Once I finished all the mixes, we got it mastered by Lionel Pedro at Trench Recordings in Toronto. Huge thanks to everyone who had a hand in making this album a reality! The Snow Original Motion Picture Soundtrack Soundtrack is available at Bandcamp, iTunes, Loudr, Google Play and Amazon. You can watch the free-to-stream version of the film today on Vimeo. Discuss the movie on Twitter using the hashtag #SnowFilm.